For Keeps Bookmark Cards are the newest addition to our product line. The writeable surface on one-half of the card provides a space to write a personalized message while sending a detachable laminated bookmark as a keepsake. 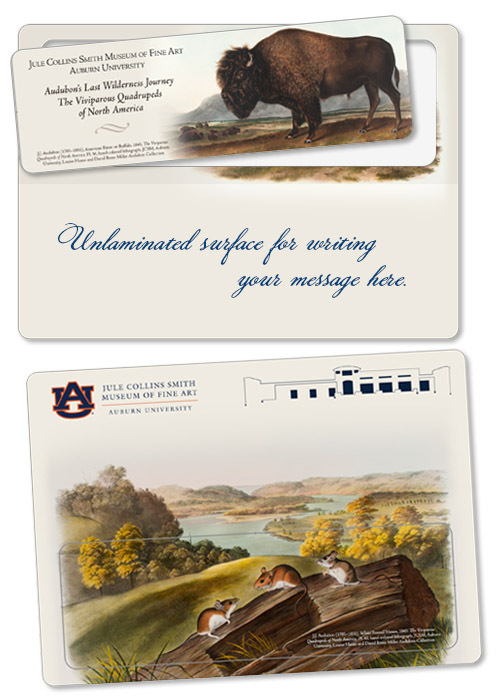 Showcase your museum with these attractive customized bookmark cards: use them as thank-you notes to donors and volunteers, as special event invitations, or as exhibit announcements. In addition, offer them as retail items in the museum store—they provide an attractive return on investment! Your 5” x 7” For Keeps Bookmark Cards are printed in full color on front and back, can be horizontal or vertical in orientation, or a mixture of both. The bookmark itself measures 2” x 6-1/4”, features rounded corners and is laminated on both sides. Purchase our For Keeps Bookmark Cards with or without white mailing envelopes. Simply send our design staff your images, logo and text on our Upload Your Files page and we will design your card. The design is included in the cost of the For Keeps cards. Another option is to create your own artwork by using our For Keeps Template. Please allow 10 days for design and production, although we can expedite your order upon special request. Low minimums! Order just one carton (100 pieces), or receive quantity discounts when ordering 5 or more cartons.